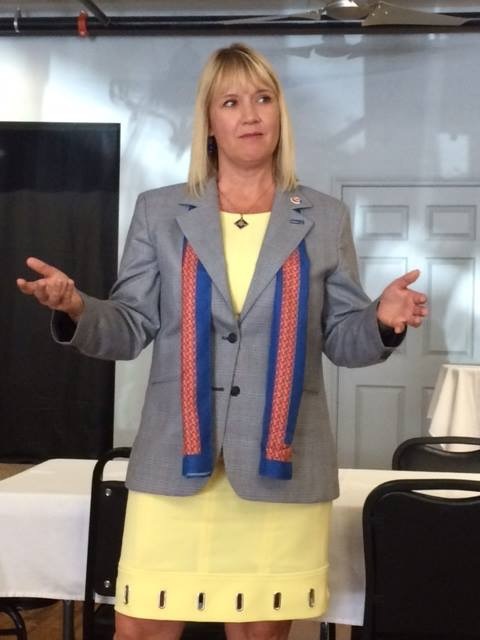 Wearing my Rotary Serving Humanity theme jacket and scarf. Each Rotary International president chooses a theme jacket and scarf that each district governor wears during the official visit. 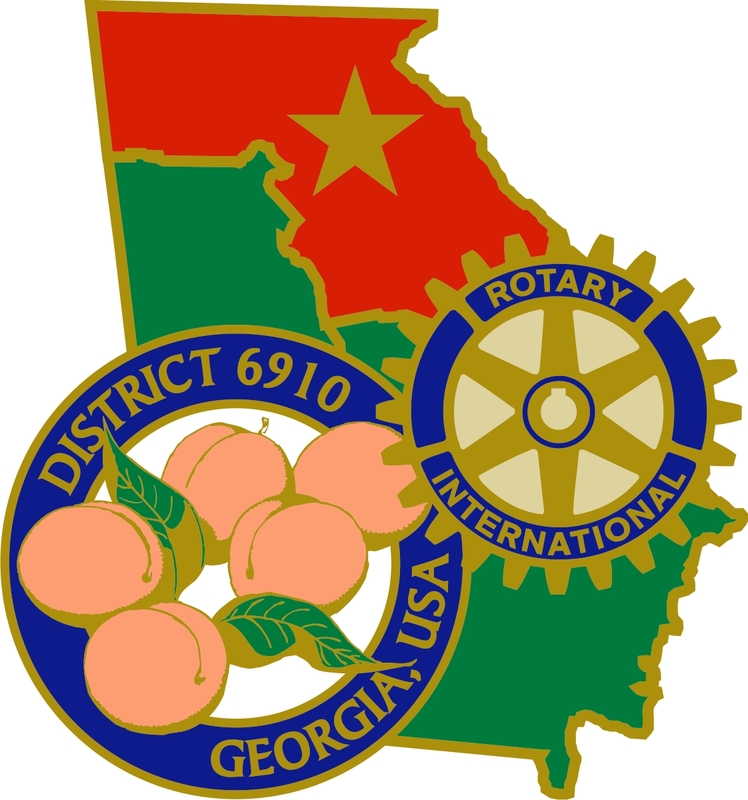 As district governor, I am tasked with visiting each of our 73 clubs in Rotary District 6910, an area encompassing 49 counties in North Georgia, roughly the area above I-20. I made my first club visits this past week. What I find most fascinating is the unique club culture of each individual club. Each club I attended this past week has quite a history, ranging in age from the 27 year club at Social Circle to the 78 year old club at Calhoun and Cartersville's 92 year old Rotary club. The Rotary Club of Social Circle meets at the historic Magnolia Manor, a private events venue, in downtown Social Circle. 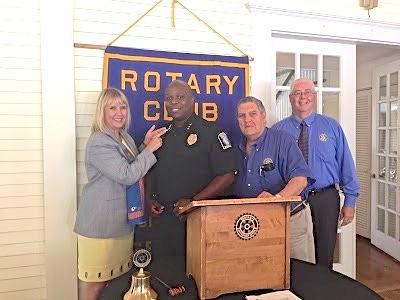 The Rotary Club of Social Circle had a special treat in store for me as I had the honor of inducting a new member, Tyrone Oliver, Social Circle's Police Chief. New member, Chief Tyrone Oliver, was pinned with sponsor Paul Posner and President Farren Elliott next to him. 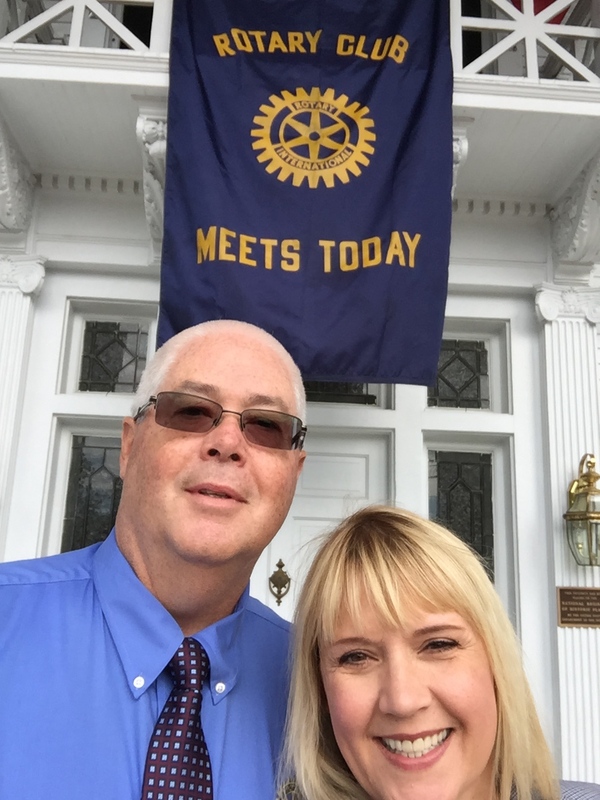 The Rotary Club of Social Circle meets on Mondays at noon in a beautiful historic building called Magnolia Manor in downtown Social Circle. The club's signature project and fundraiser is the annual community fair held each October. The club's focus centers on pre-school literacy and scholarships for graduating seniors. Making a difference in the lives of children, one book at a time, the club supports Ferst Foundation for Childhood Literacy. Since the club's inception in 1989, the club has contributed $42,000 to The Rotary Foundation. The club has provided over $127,000 in scholarships for graduating seniors which have been used to attend technical schools, universities and universities. The club ended its 2015-16 Rotary year with 19 members. Per capita giving to the Rotary Foundation in 2015-16 was $65 with total giving in 2015-16 of $1,369. In honor of our Rotary Foundation Centennial, the club is aiming for an increase in giving to our Annual Fund in 2016-17 with a goal of $2,000. The club also supports the Georgia Rotary Student Program with a student at Georgia Gwinnett College this year. Charter Member Anne Peppers was honored during my visit for serving as club treasurer for 25 years. With many of Anne's family in attendance, club member Harold Dally, the Social Circle Mayor, proclaimed 11 July as Anne Peppers day in the City of Social Circle. With Rotary Club of Social Circle Club President Farren Elliott. 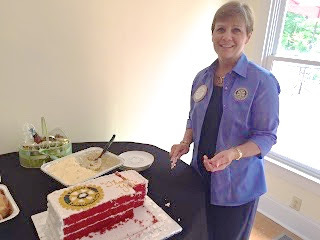 Charter member Rebecca Dally cuts the red velvet cake emblazoned with a Rotary gear in honor of fellow Charter member Anne Peppers for her 25 years of service as club treasurer. Mayor Harold Dally presents his fellow club member, Anne Peppers, a plaque commemorating July 11 as Anne Peppers Day in Social Circle. 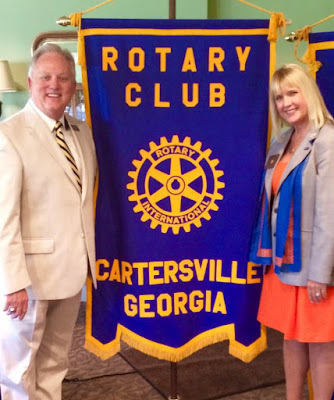 One of our district's oldest clubs is The Rotary Club of Cartersville, chartered in 1924. The club is doing a great job promoting #100ActsofGood in honor of our Foundation's Centennial on its Facebook page. Very active with youth - Cub Scouts and Boy Scouts, both Pack 24 and Boy Scouts of America Troop 24 were chartered as community outreach programs of the club. The club also recognizes Star Students and Star Teachers from area high schools at club meetings. The club ended the 2015-16 year with 41 members and $95 per capita giving to The Rotary Foundation. The Rotary Club of Cartersville has donated just over $184,000 to our Rotary Foundation since its inception. The club meets at Cartersville Country Club, overlooking a scenic golf course, at noon on Wednesdays. 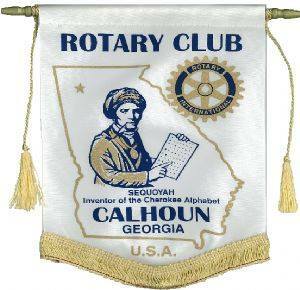 The Rotary Club of Calhoun, chartered in 1938, has several 'legacy' Rotarians. Jim Matthews, a member since 1991 and the club's Rotary Foundation chair, is the son and grandson of Rotarians in that club. President John King has a goal of task of sponsoring Jim's son which would make four generations of Rotarians in that club. Past President Jim Lay had a uncle who was in the club, James G. Lay; Phillip Beamer's father, James Beamer, was in the club. What a Rotary legacy in those families! 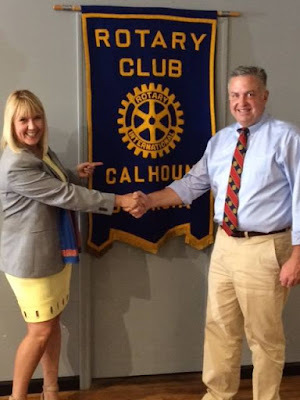 The Rotarians of Calhoun are making a big difference in the lives of others in helping the homeless and getting involved in the lives of local youth. The club sponsors two Interact clubs, two Rotaract clubs and focuses on projects that serve the community's youth. President John has done a great job seeing that the club's goals are entered at Rotary Club Central. The club's 2016-17 goal is to increase membership from 29 to 32 members. The club is a strong supporter of The Rotary Foundation at $124 per capita and a 2016-17 goal of increased giving to our Annual Fund. The club's giving in 2015-16 included a substantial $75,000 gift to The Rotary Foundation by the Paul Whittemore estate. Paul was active in the club for many years and a past President. Active in traditional media and social media, Lillian Towe, the club's Public Relations Chair, regularly posts to the Club Facebook page, The club meets in historic downtown Calhoun at Velo Vineyards. I was fortunate to have husband David drive me to this meeting. He kept saying, "This doesn't look like an area of vineyards!" Not an actual vineyard, but an event space in beautiful Downtown Calhoun and the home of Rotary Club of Calhoun. The club will hold its 3rd Annual Open Invitation Golf Tournament on Wednesday, 24 August 2016 at Fields Ferry Golf Course in Calhoun. If you're interested in more information, contact Joe Kauffman at 706-624-5325 or 270-217-5372. Not only did the Rotary Club of Calhoun present me with a lovely quilt depicting area scenes, the club presented a check for $100 to The Rotary Foundation's PolioPlus fund which becomes $300 when matched with the Gates Foundation challenge match. The Rotary Club of Calhoun meets on Thursdays at 12:15 pm at Velo Vineyards in downtown Calhoun. Good job, DG Kim! It'll be tough writing these spots when you are working on clubs 60 or 70, but I think many will appreciate it. I know I will enjoy reading more. Good luck and safe travels on the rest of your visits! Funny you should say that, Alan Horne...I was thinking as I finished tonight how I was going to curse myself for this later. Thank you for your kind words of encouragement. That will keep me going! Great info about the clubs you visited. You go, girl.